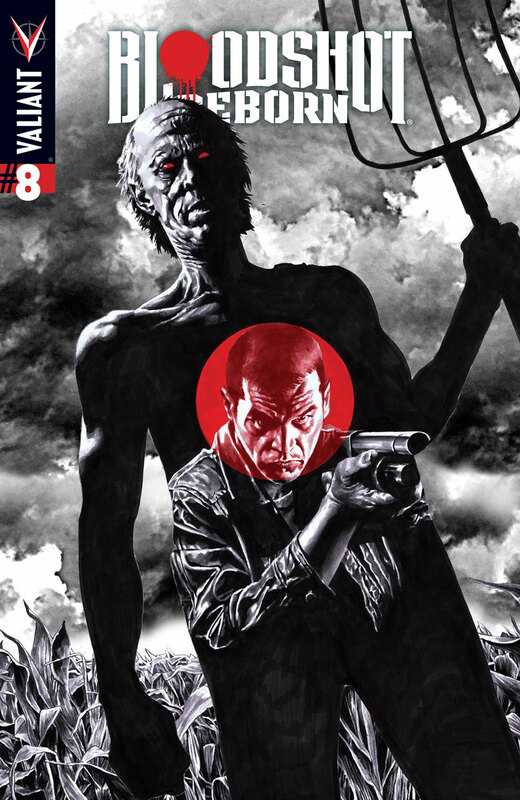 The end is near for Bloodshot Reborn, at least the end of the saga Lemire has been building since the first issue. Ray and Magic track down the next of the nanite infected, with Magic being badly hurt in the process. A dose of nanites is able to heal her, but also starts her on a transformation into becoming a monster. It doesn’t last long, though we wish it had. Magic has been a character mostly just along for the ride, having nanites in her system could have really opened many possibilities for her. Instead, the two rush towards the final target as Ray realizes who the other one hunting the infected is. Ray is mostly back to his old Bloodshot-self after having collected a majority of the nanites back. While we so still have another issue to go, he journey has really developed the character into more than just a killing machine. Hopefully this is not something for him to just revert back to after coming all this way.